The second-leg of our journey through the desert began. 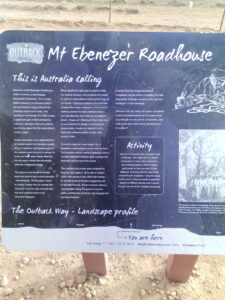 The distance from Start’s Well to Mt Ebenezer Roadhouse is 164 kms. Even though there was hardly any traffic on the highway, driving through the desert needs focus and complete concentration. There were two drivers and they were taking turns. Once one finished, he went right at the back of the bus where there’s a nice bed for him to take rest. And the other driver took charge. 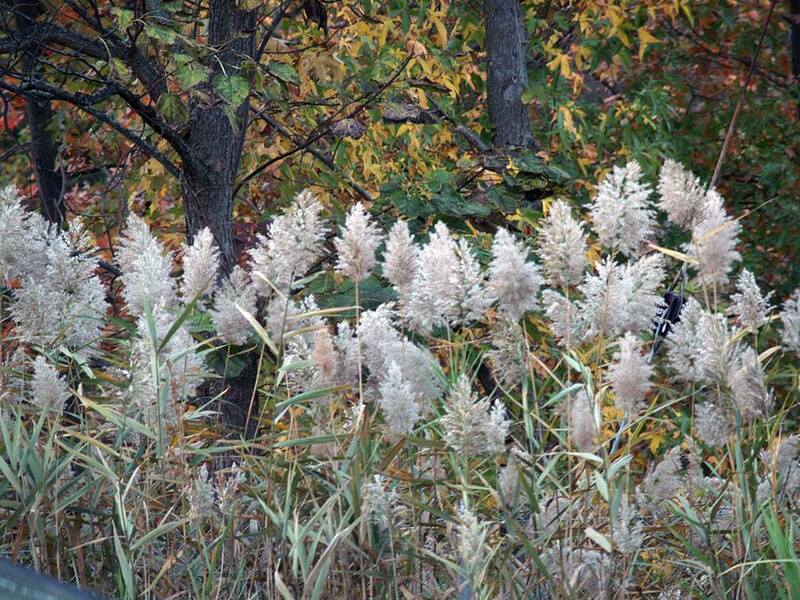 As I had risen very early in the morning, I was feeling sleepy and dozed off. However, I was shaken out of slumber as our driver put a sudden brake and swerved to avert a collision with an oncoming truck. The driver of the oncoming truck was driving perilously close to our bus. It was a close shave! As I watched the never-seen-before color of the breathtaking desert landscape and the stunning view of the distant horizon, Nature’s amazing grandeur unfolded itself in bewildering variety! 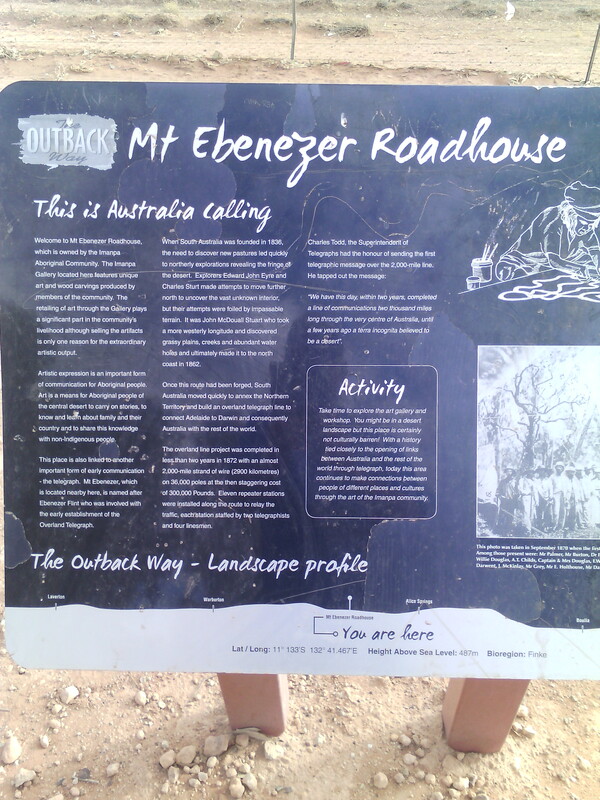 Located on the Lasseter Highway, Mount Ebenezer Roadhouse derives its name from the nearby Mt Ebenezer, which is said to be named after Ernest Ebenezer. S. Flint, who was the inspecting officer of the Southern Section of the Overland Telegraph Line. 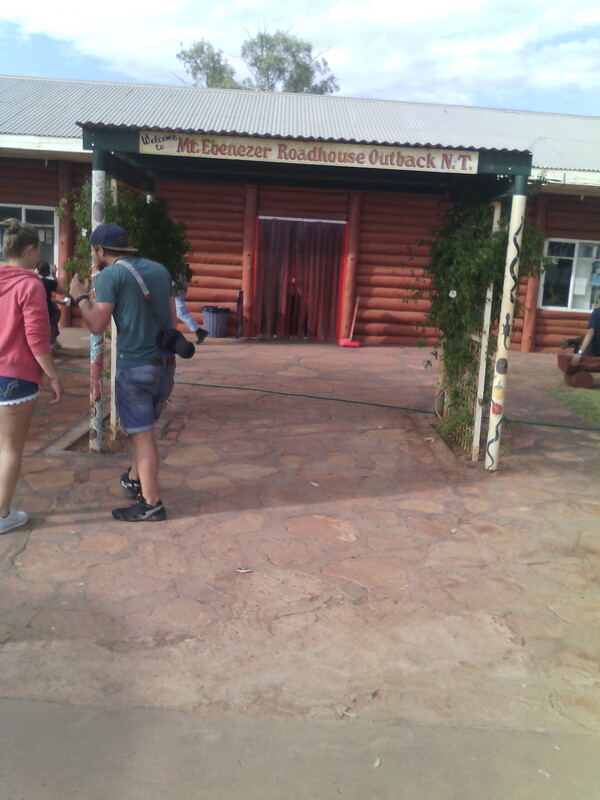 The roadhouse is owned and operated by the Aboriginal people from the nearby Imanpa Community. The building is made of logs with the walls made of local stone and timber predominantly Desert Oak. 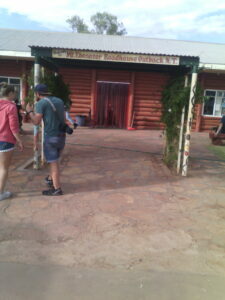 The roadhouse was originally built to serve the increasing tourist traffic making the long dusty two-day trek to Uluru. After getting off the bus, I went straight to the Aboriginal art gallery. Artists from the local Imanpa community are brought to the Roadhouse. They paint in the art studio for the day. Their painting belongs to ‘dot’ painting genre; once the painting is done, it is hung in the gallery for sale. I saw two elderly Aboriginal women artists sitting on the floor, deeply immersed in painting. This is known as Maruku arts. As I was taking notes, one of them asked: “What are you writing?” She looked stern. I got scared. However, she turned her attention to her artwork. I quickly left the place. As I was taking a stroll around the gallery, I saw a film, Uluru: An Anungu story, being shown in a small auditorium. Some tourists squatted on the floor and were watching the movie. On display were works from two other communities – Blackstone in the Ngaanyatjarra homelands and Yuendumu in Walpiri country. Each has its own unique style.